Brand New Owners Vacation Home. Looking to rent only two or three months per year. Spectacular quality workmanship. For the ultimate vacation or retirement experience. All Tommy Bahama and Natuzzi furniture. No pets permitted. House located on the edge of the inter coastal waterway. Awesome views. The home has four Trek bikes. Located 2 miles from Downtown and walking distance to the Cape Coral Yacht Club. This home was beautiful and exactly as described. The only reason for 4 stars instead of 5 is that the tile around the pool gets extremely slippery when wet. With younger kids, we had a lot of falls until they learned to slow down significantly, which was about 3 days in. Otherwise everything about our stay was absolutely wonderful and Mark was a gracious host and offered some wonderful restaurant recommendations. We saw dolphins almost every night and really took advantage of being right on the water. The house and amenities were fabulous! My family and I recently stayed a week at the Cape Paradise. Paradise it is! 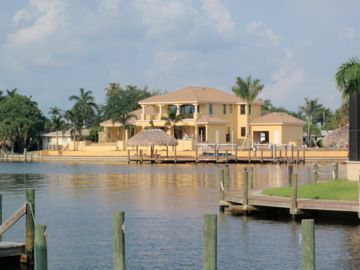 A beautiful house with very easy access to the gulf and intercostal waterway. We enjoyed every minute! The house has everything. The pool and hot tub were exquisite! We usually go sightseeing while in Florida but we all found ourselves wanting to just enjoy the house. Mark, the owner was very nice and very accommodating. We will DEFINITELY be back. We rented this palace, yes, palace, not place, for 4 weeks and were not disappointed. The 4 bedrooms worked out perfect for in-laws/kids/friends, etc. We were able to sleep everyone comfortably and privately. Spectacular sunrises over the water. We could sit and sun by the pool and watch all of the boats come back in from a day on the river later in the afternoon. Bikes to use and explore the surrounding neighborhoods. Would very recommend this for your family stay. Mark can definitely use me as a reference. The property is one of a kind and in a great location. Everything about it was top shelf. Everything was perfect could not ask for better location and the house was unbelievably awesome, we will stay here again. This is was impressive. We have a large family and we had plenty of room. The amenities made it more of a resort feeling, without the people. Normally we are always going to the beach or boating, and this was so nice that there were several days we just stayed around the house. It was close to everything (restaurants, grocery stores, boat house). Mark was very responsive when we had questions. The saddest part of this experience is when we had to leave. Definitely would be looking to rent again next year.